Custom Safety Products provides answers to an age-old problem. We manufacture the original non-skid, positive traction pads for the different work areas on the rig floor. Don't be fooled by inferior imitations. Since 1979, more than 8,000 drilling rigs and over 800 customers worldwide have used the design created by Custom Safety Products, Inc. This design includes the familiar stud and groove pattern, as well as the unique puzzle-cut method of locking rotary mat halves together. Winner of the 1991 Special Meritorious Award for Engineering Innovation, Custom Safety Products continues to improve the Safety Pad, with new variations for different applications. Surveys reveal that our safety mats reduced slip-fall injuries 99%. Stay with the original, and you can be sure you are working on the number one non-slip work surface in the Oil Patch. Please explore our site to see more of our products. Custom Safety Products, Inc. is an authorized representative for Advanced Mat Systems and Safeguard Technology. All other products viewed on this website are manufactured by Custom Safety Products, Inc. in Friendswood, Texas USA. PT Apexindo Pratama Duta Tbk. Automotive & General Supply Co.
BSI Drilling & Workover, Inc.
Canmar - Reading & Bates Ltd.
Chuan Huat International (s) Pte Ltd.
Construssiones Industriales y Ecologicas | Del Sureste, S.A. de C.V.
Conval Oilfield Services Pte Ltd.
DS Servicios Pertoleros S.A. de C.V.
Dalian Shiheng Trading Co. Ltd.
Eastern Well Rigs Pty Ltd.
Electronica Y Comunicaciones S.A. de C.V.
Energy Equipment Services Pte Ltd.
Energy Resources & Supply, Inc.
Greatwall Drilling Co. (Thailand) Ltd.
Industrial de Servicios & Outsourcing S.A. de C.V.
International Tools & Supply Company, Inc.
Jaslo Oil & Gas Exploration Co., Ltd.
K S Right Viking Ltd.
Kim Heng Marine & Oilfield Pte Ltd.
Labroy Offshore Engineering Pte Ltd.
Larsen Oil & Gas Pte Ltd.
Lone Star Safety & Supply, Inc.
Loosebrock Europe Trade & Supply B.V.
Mantto Offshore S.A. de C.V.
Marlin Offshore Services (Thailand) Ltd.
Mason International Oilfield Supply, Inc.
Mayoreo de Refacciones, Motores & Equipos, S.A.
Mica Supply & Specialties, Inc.
Oilfield Equipment Components, S.A. de C.V.
PV Drilling Overseas Company Private Ltd.
Panamerican Industrial Services, Co. Inc.
Poszukiwania Naftyi I Gazu Jaslo SP.ZO.O. Proveeduria, Obras Y Mantenimiento S.A. de C.V.
Queiroz Galvao Oleo e Gas S.A.
Republic Drilling & Service, Inc.
Rig Resources AP Pte Ltd.
Rio Grande Supply Co., Inc.
San Antonio Equipment Supply, Inc.
Seadrill Deepwater Units Pte Ltd.
Seadrill Offshore Singapore Pte Ltd.
Sonpetrol Mexico S.A. de C.V.
Standard Equipment & Supply, Inc.
Tasman Oil Tools Pty Ltd. The Offshore Drilling Company, Inc.
Tradequip Services & Marine, Inc.
Transocean Cyprus Capital Mgmt Public Ltd.
USS Oil Well Supply Company International, Inc.
United Service & Supply Co.
Zacatecas Jackup S.A. de C.V.
Hereby in behalf of Astanient S.A. de C.V. we would like to gladly share our experience with Custom Safety Products, Inc. (CSPI). We are a company located in the Gulf of Mexico in the offshore drilling oilfield. We usually are in need of drilling floor and mats. After looking in the market we found CSPI as the best option for us, good delivery time, high quality products and excellent customer service; they answered every little question we had and widely explained every important point in purchase process. Our experience with CSPI is completely satisfactory. We highly recommend their products and service. Oswaldo A. Perez Aco. | Purchaser. Kendall, the new design floor mats, without the studs, has more than exceeded our expectations. The harsh environment we encounter in the Baaken field is challenging in all aspects. Winter conditions present opportunities for a slip fall on a constant basis. The drilling fluid used is "invert" a type of oilbase that combined with sub-zero temperatures can be very slick. We have equipped all of our Bakken rigs with your products. This has allowed us to all but eliminate slip falls on the rig floor. The only comments from our employees were that the steel studs were tough on boots and knees. The new design mats have solved these topics. Our decision to put the racking board mats on the cold country rigs was a wise decision. We have not had a single ice plug issue since we installed them. The drilling fluid, snow and water drain out every time. The drilling fluid drains to the sides where our drain pans catch the fluid. The biggest advantage has been for our employees. Whether tripping pipe or tailing pipe in the v-door traction is not an issue and we have not had an incident. In the modern oilfield safety is a core value. Making an investment to maintain a safe work environment is a must. The equipment we have purchased from Custom Safety Products have more that paid for itself through the reduction in accidents in out drilling fleet. Kendall, thanks to you and your employees for helping to protect our employees. Matt Smith | Purchasing and Expenditures Manager | Bronco Drilling Company Inc.
We are proud to endorse your product and your company. We purchased the first mats for our rigs over 25 years ago and have continued to do so for every one of our now 20 rigs. We tried an import mat made of some kind of recycled material about 5 years ago, but it quickly started curling and created a trip hazard on our rig floor. We have also purchased your racking mats and center mats which have held up as well as the rotary mats. At Scandrill Inc. we appreciate the long term relationship and your willingness to repair or replace lost sections or damaged mats years and years after the original purchase date. "The Performance Driven Drilling Contractor of Choice in the Ark-La-Tex Region"
Custom Safety Products has provided a drill floor mat which is satisfactory to company requirements. After asking several managers what vendor to get the mats from, the only response was C.S.P. This speaks volumes regarding the results this mat has produced since there wasn't even a suggestion as to research other vendors. The safety department and operations management would like to thank you for introducing to us the safety pad I and safety pad II. Since our introduction to the pad in 1980 when our first big rig went to work, we have purchased 11 pads for our rigs. We have been very pleased with the pads; the durability of the pad and the prevention of non-slippage with the non-skid surface and the grooves made the difference. We can honestly say we haven't had a major or severe accident on the rig floor that resulted in someone slipping, twisting the knees, or falling on the rig floor. We can contribute several factors why the safety pad has been a great attribute to our rigs. A durable product doesn't wear and holds up to all types of chemical and drilling mud additives. The non-skid surface prevents slippage of the feet. The deep grooves help the men have sure footing when pulling slips or when latching tongs onto drill pipes. Easy to keep clean and can be resurfaced with no downtime to the rig. Gives the men a softer cushion on their feet. Eliminates body fatigue as to standing on hard steel grating. An added safety feature when presenting rig for job. We just wanted you to know that over the past five years we have been very pleased to have these safety pads on our rigs and will continue using them. And the reason for purchasing these pads is to help revent accidents on the rig floor. Roland | Safety Director | Booker Drilling Company, Inc.
Our first Safety Pad II was installed on Rig #13 in November 1981. Since then, Rig #13 has logged over 700 operating days and the pad is still providing an effective slip resistant working surface around the rotary table. As you are aware, we continued purchasing Safety Pad II until all 17 of our land based rigs were equipped. I am convinced that the Safety Pad II has been one of the wisest and most cost effective rig safety equipment investments we have made. I have not identified a single injury where insecure footing around the rotary table was the primary cause or a contributing cause, where the Safety Pad II was in use. I believe the secure fotting that the pad provides has been an important contributing factor to the 69% reduction in our disabling injury incidents rate from 1981 to 1984. I would not hesitate to recomment the Safety Pad II, if properly sized and installed, as an effective safety device on oil and gas well drilling rigs. Gus | Basin Drilling Corp.
Houston Offshore International would like to thank you for the trial installation of the Safety Pad II on our mobile offshore drilling units, Sabine I and Sabine IV. Rig supervisors state that they have several advantages that make them an asset to the rig floor. First off, the Safety Pad II reduces slip and fall incidents to practically nil. Employees are able to maintain traction around the rotary table even though it may be wet or covered with drilling fluids. Trip time, both going in and coming out of the hole is reduced as much as thirty (30) minutes per trip which equates to one hour per round trip. Second, rig operating costs are reduced in that there is no longer a need to use roofing paper or coco mats as an anti-slip surface. The surface of the safety pad, even after the 90 day test period, appears to have no surface wear. Based on good experience and positive statements for the a/m product from the drilling personnel on "WEST VANGUARD," we have acquired the Safety Pad II also for "WEST VENTURE." On board "WEST VANGUARD" it has been in use approximately 10 months. We may also add that during this period, there has not been a single slip-fall injury on the rotary table. The SAFETY PAD II around the rotary table was put into service on January 17, 1983. It must be some of the best to be found on the market. We are extremely satisfied with it, and it has not been damaged at all. Subjected to very rough treatment. The undersigned introduced it on "WEST VENTURE" having seen it in use on "VILDKAT" where they also use oil based mud. It gives a remarkably good "footgrip" and despite spills of oilbased mud, it has increased the safety to the workers. Use of other remedies, such as Wallnut shells etc, has not nearly the same effect. These are dissolving, and may cause problems to the ball bearings for the rotary. It is strongly recommended by the undersigned. We have had the Safety Pad II on board from April 17, 1983. The crew on WEST VANGUARD is very pleased with it. It has a somewhat rough surface with an approximate 20 x 20 cm square pattern on top. Additionally, there are some small steel-spikes sticking out approximately 5 mm. These give a very good friction to the feet. Following almost a full year's use, one can hardly see any wear and tear on the pad. 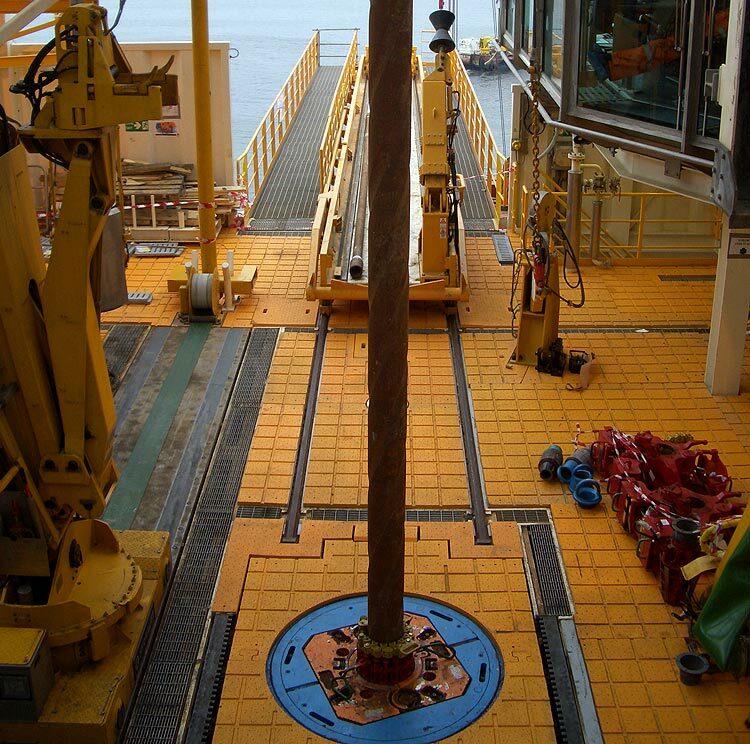 Normally, heavy tubes or drillstring stands are not placed on the mat, but other heavy equipment, such as heavy XOs have fallen down on it, without damaging it. The undersigned has also seen the Safety Pad II in use on D/R "NORDSKALD" (GLOMAR BISCAY 2). There, also drillstring pipes were stored on the pad, without causing any damage to it. I would like to bring your attention to the status of the Safety Pad which Grace Offshore Company has acquired over the past 8 years. As a drilling company engaged in everyday activities on the rig floor and people using their bodies to twist, turn, pivot and use their backs while tripping in and out of the hole and latching tongs, your safety pad II has been a great asset for us over the years. We cannot recall any serious accidents or incidents which resulted in a lost time accident. The durability of the pad over the years with little maintenance, the non-skid surface and the grooves made the difference in our people not slipping and falling on the rig floor. When we do have maintenance on the pad and the rig goes to work without it, the toolpushers and rig floor crews want to know "where's the safety pad?" This alone tells us that our money was well spent for a product that came into the market place just 8 years ago when we were first introduced to it. We at Grace Offshore just want to thank you for bringing this product to our attention and that any other rig that goes to work without it will have one at it's earliest convenience. We are impressed with the performances of your product, and intend to provide each of our rigs with one as budget permits. Pete | Administration Manager | Peter Bawden Drilling Inc. I wanted to write you to let you know how much we have enjoyed your product, Safety Pad II. I have talked to the toolpushers on both hitches and most of the men we have on the Gulfdrill who are using it. Everyone has told me it's the best way that they have seen yet to control the problem of slipping down on a muddy rotary table. From a safety supervisors out look it's working out better than I thought. We have almost eliminated all of our accidents on the floor due to falls or slipping down with the Safety Pad. The claims for the injuries we were having have gone down to a point now that the pad has almost paid for itself. I want to compliment you again on your product. I feel sure in time we will call for a pad for each of our rigs we have now. J.D. | Safety & Training Supervisor | Nordrill, Inc.
We would like to express our opinion concerning the mats around the rotary table. Floor mats give very good footing even with oil based muds. Floor mats give more stability of footing, helping to keep production at a maximum. Floor mats help keep accidents down, because of less slippage. It is in our opinion that floor mats would be of great concern around rotary table and drill floors. All crews on Continental Drilling Co. Rig #3 would like to thank the company for providing the rotary table mat on this rig, and would like to have these mats around floor as well. Bill | Continental Drilling Co. Your request for accident information in regards to our using your Safety Mats is, I am certain, an honest one. So with this in mind, I will give you an honest answer and it is that we at AWI have nothing but praise for your product. We not only feel it has reduced our slip and fall accidents to zero wherever we install your mats, but our employees' morale has also greatly improved. As you are well aware, we did not limit your mats to the rig floor area, but also on the monkey boards to help improve footing for the derrickmen. In conclusion, since we installed your safety mats on ten of our eleven rigs, we have not had one slip related accident. Mike | Safety Director | AWI, Inc.